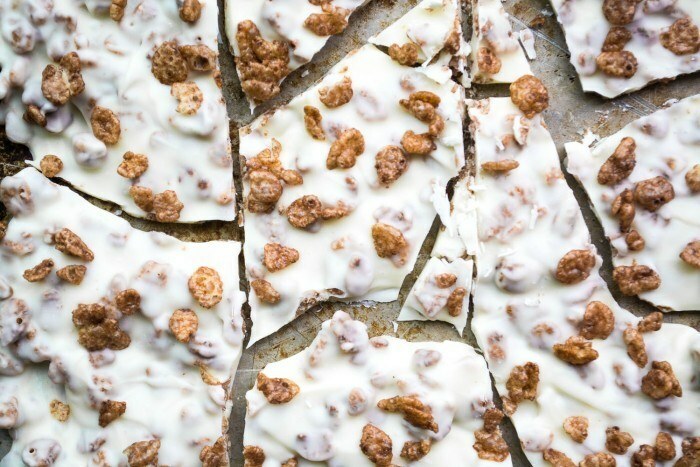 My Cocoa Crunch Bark is like a homemade version of a Nestle's Crunch bar turned on its head with a white chocolate base and Cocoa Krispies for the crunch. Put the wafers into a microwave safe mixing bowl. Microwave for 1 minute, and then remove and stir. If the chocolate is not completely melted and smooth, microwave for another 15 second burst, until it is. Stir well in between to give the heat of the bowl enough time to melt the chocolate, you don't want to over heat it. Immediately stir in the Krispies and then pour the mixture out onto an un-greased cookie sheet. Spread the mixture out with an offset spatula to a thickness of about 1/4 ". The chocolate will stay soft, so you can take your time with this. Sprinkle on a few more Krispies on the top for garnish. Gently push them in with your fingers so they will adhere. Let the bark sit until hardened, or put the tray in the refrigerator to speed up the process. When completely hardened, slice into pieces with a large knife. Store in plastic baggie or cellophane bags.